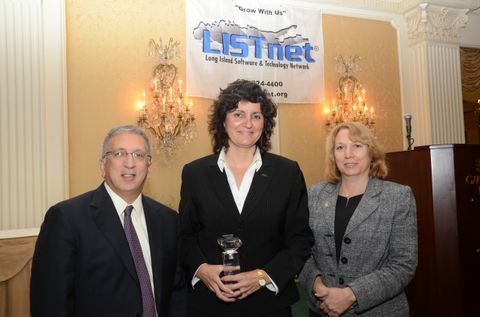 BETHPAGE, N.Y., Nov. 21, 2011 -- Jane Bishop, director of program integration and enterprise management for Northrop Grumman Corporation's (NYSE:NOC) airborne early warning integrated product team, has earned the Diamond Award from the Long Island Software and Technology Network (LISTnet) for her leadership in the field of technology. "Jane's contributions serves as an inspiration to all future leaders â especially young women who are coming into the technology field. She is a great role model to all," said Pat McMahon, sector vice president and general manager, Battle Management and Engagement Systems division of Northrop Grumman Aerospace Systems. Bishop began her career at Northrop Grumman 25 years ago, first as an antenna and radio frequency equipment design engineer, on the E-2C program. Over time, she became a program manager on the E-2D Advanced Hawkeye program. She is now responsible for managing program integration across the entire airborne early warning and battle management command and control integrated product team. "I'm honored to accept this award on behalf of my family and the entire Hawkeye team. I've had an incredible career so far and all of my experiences have made our company's mission very personal to me. All of us live each day knowing that we are preserving freedom, through performance and innovation. I ask that we all remain committed to advancing opportunities for our next generation of young women â especially in the field of technology and innovation," said Bishop. LISTnet is a nonprofit organization with over 1,000 members and 80 corporate sponsors, including Northrop Grumman. McMahon is a previous Diamond Award winner and has served on the LISTnet board of directors for many years. Founded in 1997, its mission is to promote Long Island as one of the national centers of excellence for Software and Technology solutions.